Aligners are a good way to move teeth a little bit….for patients with very minor conditions. 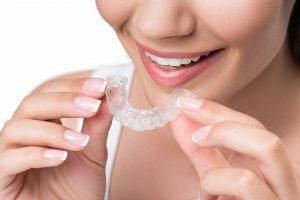 If you have one or two crooked teeth, a couple of spaces or some minor crowding, you might be a candidate for treatment with aligners, which are made of a clear, safe plastic, the same material used to retain the teeth. If Dr. Piper decides he can correct your condition with an aligner (or a series of them), we make them in-house at a fraction of the price of the nationally advertised mail order brands. At your free consultation appointment, Dr. Piper will determine if you need traditional braces or removable aligners.